We will begin a detailed review of this book on The Equippers Edge Blog in the near future @ http://equippersedge.blogspot.com. Please check that site in about a week to begin the review. Your comments and interaction are invited. The material below is from the sites linked below. Becoming an off-road leader requires the cultivation of certain spiritual disciplines that allow the presence of the Holy Spirit to arrange your interior life. 1. Death: The Discipline of Personal Transformation. 2. Truth: The Discipline of Sacred Realism. 3. Perspective: The Discipline of POV. 4. Learning: The Discipline of Reverse Mentoring. 5. Witness: The Discipline of Spiritual Friendship. 6. Humility: The Discipline of Decreasing. 7. Assessment: The Discipline of Missional Efficiency. 8. Harmony: The Discipline of Blending Differences. 9. Reflection: The Discipline of Discernment. 10. Opportunity: The Discipline of Making Room. 11. Sacrifice: The Discipline of Surrendering Preferences. 12. Legacy: The Discipline of Passing the Baton. Earl Creps—a popular speaker and leader—is director of the Doctor of Ministry program and associate professor at the Assemblies of God Theological Seminary (AGTS) in Springfield, Missouri. He has been a pastor, ministries consultant, and university professor. Along the way, Creps earned a Ph.D. in communication at Northwestern University and a doctor of ministry degree in leadership at AGTS. I want to refer you to a review listed below. America Alone: The End of the World as we Know It Is the free West "sleepwalking into a trap of its own making while blissfully ignoring the many danger signs that are everywhere"? 1.Is the basic tenet of this article and book true? 2. If the the basic arguement of this book is true, what should the Church be doing to bring Christ to our changing world? 3. Do we need to be doing things differently then we currently are? 4. Do we need to fall on our faces and cry out to God to hear from Him or do we believe we just need to work a little harder to accomplish our current plans? Please read the article and come back to this blog and leave a comment? 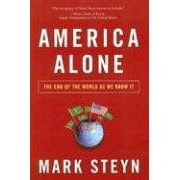 "America Alone: The End Of The World As We Know It brings together some of the big themes of Mark's writing in recent years - demography, the unsustainability of the welfare state, a resurgent Islam, and the west's loss of civilizational confidence. The result is an incisive examination of how the world could look the day after tomorrow, on the brink of a new Dark Ages. Permanence is the arrogant assumption of every era, and ours is no exception. But in Europe, the Middle East and beyond history is on the march, and moving very quickly."